Have An Amazing Dinner While Cruising on Lake Ontario! A fine meal can be the highlight of your cruise. We can provide the simplest of menus to the grandest of feasts. Our usual display consists of 'welcome aboard' hot and cold appetizers and h-d'oeuvre served by our hostesses, this is followed by your choice of hot entres served with salads, breads, specially prepared potatoes or rice. Our delicious deserts are prepared by Toronto's most famous pastry creators. All of our meat, fish and poultry are barbequed fresh on board, right before your eyes. Mouth watering aroma of bbq will fill the yacht as you power silently across the harbour admiring the impressive Toronto skyline. And feel free to customize your dinner cruise: perhaps a focus on having a "BBQ Cruise" or arranging a "Murder Mystery Dinner"? Or synchronize your own "Jazz Cruise" with Toronto's various jazz festivals? 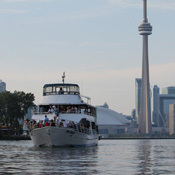 Miss Toronto can be your floating Toronto Harbour restaurant and host your perfect "dine and dance" evenings, but we can also arrange breakfast cruises and lunch cruises during daylight hours. Plan your next dinner cruise aboard Miss Toronto.